Chinese New Year is January 23, 2012. I love the colorful pageantry associated with this holiday! Last year I created a traditional Chinese New Year tablescape using lots of red and gold with black accents. (Click HERE and scroll down to “Year of the Rabbit” to see last year’s post.) This year, now tired of all the red used for Christmas decorating, I went rogue with a fiery hot pink. One of the great things about this particular tablescape design is that the Asian influence is somewhat understated, thus rendering it suitable for various contemporary-styled occasions such as rehearsal dinners or ladies luncheons (sans the candles, of course). The two-tone linen combo of sizzling hot pink over the more neutral black immediately draws the eye in. To demonstrate how the same dishes can create an entirely different atmosphere depending on the accessories, compare this setting to that of “Let Them Eat Cake” from a post last year. (Click HERE and scroll down to “Let Them Eat Cake“.) A gold leafed glass charger and gold-rimmed white china from Pier 1 are topped with an F. Winkel & Co. “Jacobean” salad plate. The vivid coloring and busy pattern of the salad plate are just the right combination to accent the plainer underplates and bring in the black, gold, hot pink and white. I had my eye on these Buddhas from the moment they hit the store shelves at Z Gallerie last year. I must have chewed half a pound of fingernails waiting for them to go on clearance, hoping there would be enough left over. Jackpot! Got all I needed at 75% off!!! Here they hold a gold mercury glass votive. 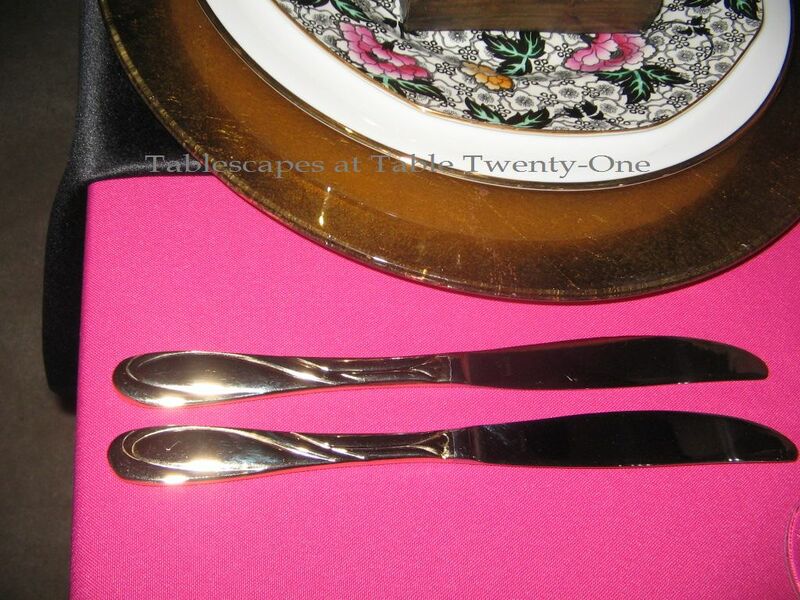 My “old reliable” goldtone flatware works well here with its subtle pattern. I opted for crystal stemware with gold rims, but opaque black stemware like Mikasa’s “Elegance-Black” would work well, too. I felt the need to break up that searing hot pink surface a bit more. I achieved this by folding the black poly-cotton napkins from Bed Bath & Beyond into a long chevron and placing them beneath each setting, allowing them to extend downward over the pink linen. I almost always use either white or ivory candles, but I’m getting bolder in my old age! 😉 Long black tapers are set into a trio of 20″H goldtone candlesticks to add height and color down the table’s center. 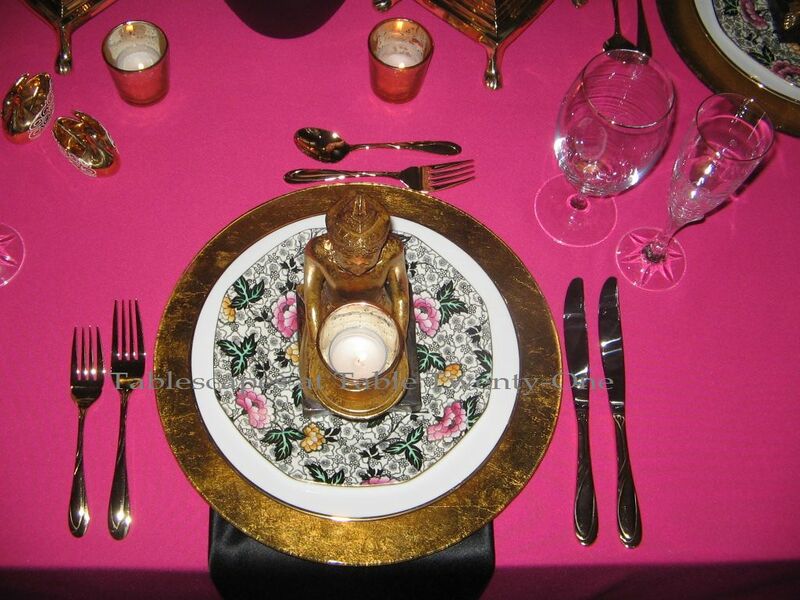 Lined up on each side of the centerpiece are four gold mercury glass votives to add ambient light at the lowest level. The notably restrained buffet decor is a giant black ginger jar flanked by a pair of the same F. Winkel & Co. plates as used on the table. 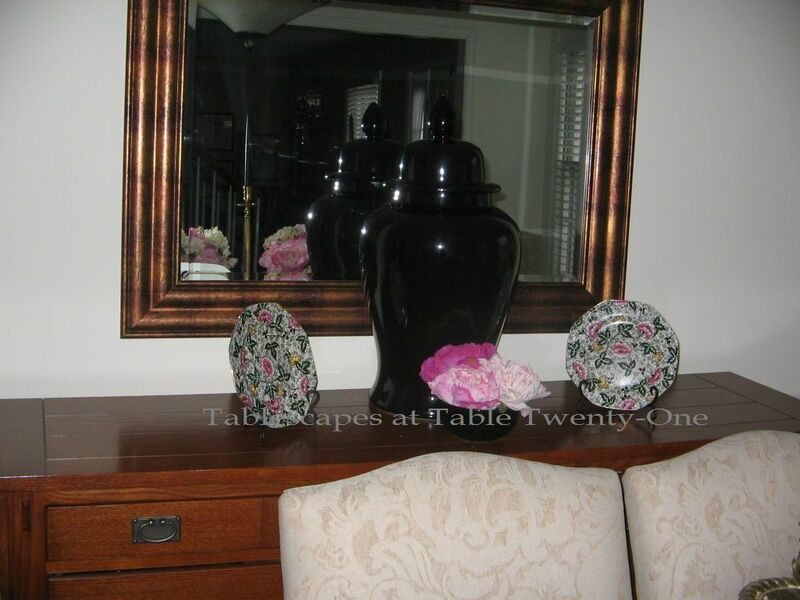 Florals from the table are extended by simply plopping 3 peonies into a shallow black bowl. 2012 is the Year of the Dragon, so printed menus with the Chinese symbols for dragon – 龙年 – or a dragon watermark, or menus in the shape of a dragon would be another element to make this table special. Specialty stores may carry oversized ceramic dragons which would be a great addition, too! (Or go check out Grandma’s attic for them. These dragons, as well as panthers for some odd reason, were all the rage in contemporary 1960s homes.) A nice substitute for the peonies would be deep pink carnations, orchids or, depending on availability, pink plum blossom branches which symbolize luck. If your budget allows for it, rented bamboo chiavari chairs in black would be the crowning touch! Thank you for stopping in! I hope you’ll join me again this week at Susan’s place for Tablescape Thursday! You can also catch me at BeBetsy.com! Alycia, The Buddhas holding the votive make such a dramatic look. How lucky to get them on clearance and to find enough of them. Great colors and peony vases. Beautiful! Oh how I would love to sit in on your classes. The Asian influence here is evident but not over the top. Well done dear friend. Oh boy I love that punch of pink! What great eye candy, especially at this drab time of year! The chevron shaped napkins add such a nice elegant look. Your buddhas are so cool! I would be broke if I had a Z gallerie near me! I’ve only ordered from them on line but I always find stuff I like!! I really love the design on the plates and how your flowers work with them. Wouldn’t it be fun to be dressed in Kimono’s for this!! Pass the sake!! (Okay I just went Japanese) Love the giant candlesticks too- they make quite an impression! You have so many nice elements! Another pretty table! I love the pink and the flowers look real to me, I was wondering how you got so lucky to get such beautiful peonies at this time of year! Altogether lovely! BEAUTIFUL! Love Peonies! They are my favorite! The Black against the pink really makes it pop! I am diggin it!!!! 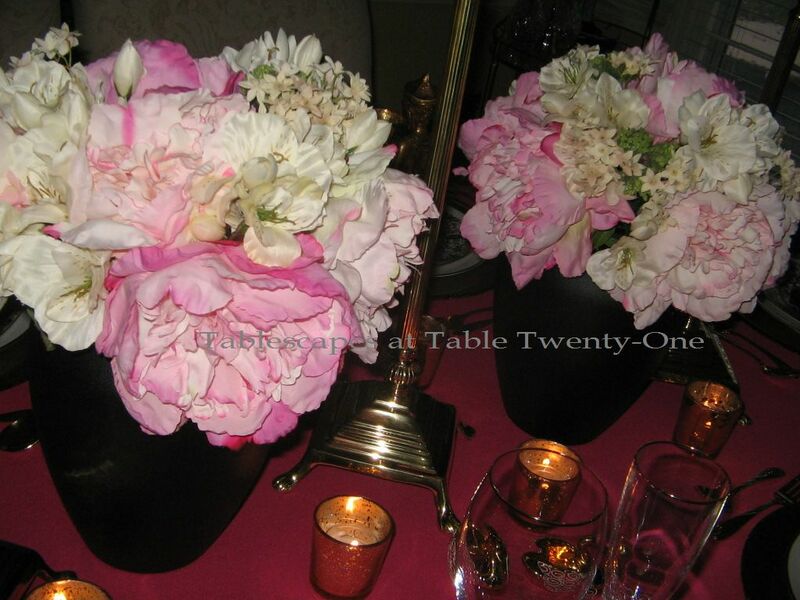 Hi Alycia: absolutely stunning table setting, you know I love peonies, love the black tapered candles too. Girl, where on earth do you keep all of these beautiful place settings? WOW! I love that table cloth. My best friends daughter is getting married soon so we have be doing lots of planning and I think Pink and Black are on the top of my list for favorite color combos. Your table is beautiful, as always. I love the tall candle sticks, love what they add to the table. I am inpressed with your patience on waiting for the little statues to go on sale…I’m a little too implulsive. I find things and think I have to have them NOW! Thanks as always for sharing your beautiful table and giving us tips on how to set a beautiful table. What a stunning, dramatic table, Alycia! The pink and black color combo looks sophisticated and festive, and those salad plates really fit the theme beautifully! Strikingly beautiful! I thought the peonies were real and was lamenting the fact they don’t grow here. 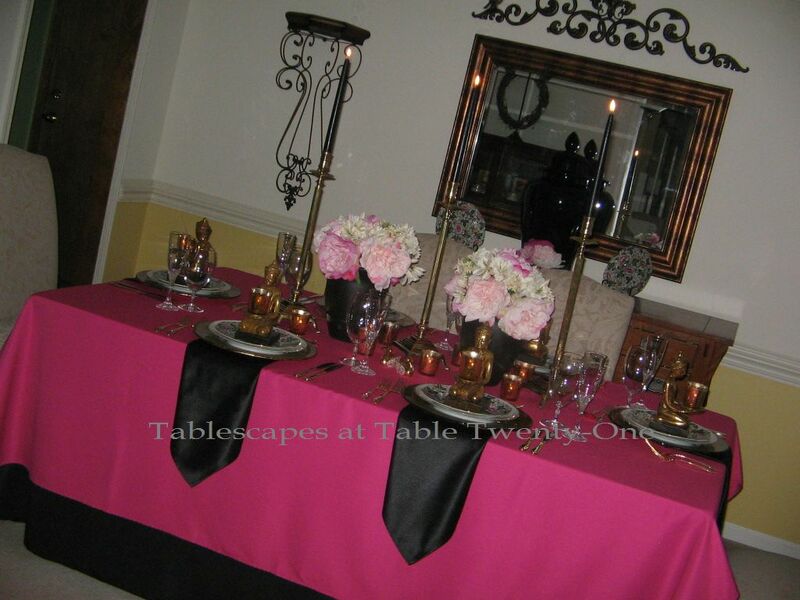 The black napkin against the hot pink tablecloth gives an absolutely stunning effect. Congrats on scoring the Buddhas. I love how you give a lesson with your pictures. I’m learning so much from you. Thanks for another gorgeous and elegant presentation. Beautiful Alycia. I love the colors you chose and the Buddhas are wonderful! Just wonderful!!!! Those Buddahs are amazing! I love the hot pink angd black too. Are you enjoying the nice weather? I hope we dont pay the price in Feb. again! Fingers crossed! Thanks for stopping by the blog!!! Hope you are having a great 2012, its obvious you are having a creative one for sure! Love all your work!!!! WOW! The colors are so stunning. I do so love the pink and black. Beautiful! This tablescape is so gorgeous–I love the fuschia pink and black. So vibrant! And I love the centerpiece with the tall tapers-dramatic! Love these colors…for me, you can’t go wrong with hot pink! Happy Chinese New Year! That is stunning! I love that you used hot pink for a Chinese table!!!! Great job! I love the drama of those candles! Great take on Chinese New year, the hot pink and Budhas are great! I’ll email you about the broiled tomatoes. Oooooo, pink & black are always SO enticing! Love what you did with the various Asian elements. We had FL friends who would order HUGE amts. of Chinese carry-out & host a similar party every year. Her tables were never this gorgeous, though. LOL Well done! Such wonderful color on your table. This is a beautiful Chinese New Year table. The pretty china colors and the little statues are just perfect. Ooh la la! How do you say that in Chinese? This is fabulous. I love the pink and black and those candleholders, I am just drooling over those! You are always so wonderful in your fabulous creations! I would love to be invited to sit at this fab table. Your tablescape is stunning! I love your the use of color. WOW! Thank you so much for stopping by, then i could find you! Hi I probably would not of thought of hot pink but it sure does pop.love the peonies and the gold combo. Up north we are getting an ice storm. My pine tree is bowing low. In the early 90’s we had no electric for 13 days and I am all electric. It was all up along the St Lawrence river for hundreds of miles.We lost almost all the telephone poles the whole way. The army came in to help. I was with my son the whole time with 4 dogs 5 cats aquarium and 12 people. We are praying this is not going to be that bad. Just love your Asian inspired tablescape. Those buddhas were quite the deal!..Makes quite a statement on the entire tablescape. Just love how you pulled the colors together!..Thanks for stopping by and seeing my Pearscape! Love the pink and the peonies…………gorgeous, and the black adds such drama, and the gold that touch of elegance. Great seeing shocking pink after all the Christmas colors! The peonies are so gorgeous, I love those big fluffy flowers! I love this! I’m a big fan of black and pink anyway so I’m glad you went rogue and ditched the red for this table. Plus, I love peonies. They are my mom’s favorite flower. We can’t grow them well here. I love the fact that you found those Buddhas and waited until they went on sale. (Every time I try that, someone else snatches them up first!) They give every place setting a majestic sort of look. And I love the use of black candles. I have never used black candles. I need to get bold in MY old age too. BTW, I wasn’t getting these emails to open for a while there. I was very glad to see that I could this morning. Crossing my fingers that this comment posts…. Your tablescape is Beautiful with the pink and black !!! I have a love for the two colors together as you know sweet lady, the centerpiece is Gorgeous with your flowers…. Thanks so much for your sweet comments on my Tablescape. I hop you and your family have a wonderful weekend..
Hi Alycia~ Love your bold Hot Pink & Black combination for ushering in the Year of the Dragon! Congratulations of waiting out your Buddhas and scoring them at 75% off (that would NEVER happen for me BTW 🙂 Your faux flowers are so realistic I would have thought they are real! Happy Sunday to you!